Easy to dose all year round - can be used in Winter too - simply scatter on pond surface. Supplied as a 500g re-sealable sachet - dose at 100g eor 1,000L (200 gallons pond). New onto the market, Pond Equaliser brings professional quality pond-keeping science to the amateur pond-keeper. Pond Equaliser provides the essential minerals required to optimise and stabilise key water properties such as carbonate hardness and pH. It adds calcium to the water, neutralising toxic heavy metals and ammonia, whicgh are harmful to fish. By improving base water quality, the biological capabilities of the pond are muich enhanced, ensuring natural bacterial pond maintenance products work to their optimum. 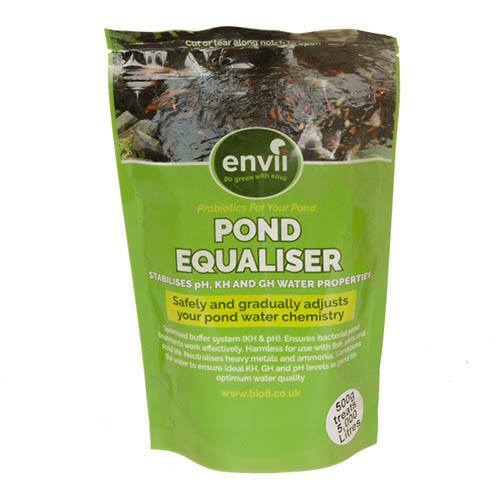 Pond Equaliser only contains natrually occurring ingredients found in clear water, so are completely harmless to fish, pets, wildlife and children. Use 3 times a year throughout season, even in cold weather unlike some treatments, Use 100g per 1,000 litres (200 gallons), scatter across pond surface, do not dissolve or pre-mix. 500g re-selabale sachet. Dose at 100g per 1,000L pondwater, scatter on surface.